Grommet Drapery shown in China Club. Design by Kate Eckstein Design. 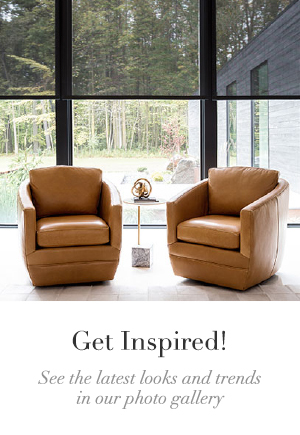 The living room is the heart of the home, and so its design should reflect the epitome of your personal style. Whether you’re drawn to cheerful colors or prefer calming neutrals, The Shade Store has the custom living room drapery design for you. Find some inspiration for your living room curtains in these interior designers’ looks. Curtains are the perfect place to add color to your living room while keeping the other major furniture pieces neutral. In the design shown above, Kate Eckstein paired a colorful Anthropologie rug with a light colored sectional sofa, and accented the room with Grommet Drapery in Diane von Furstenberg’s China Club, color Indigo. The mixed patterns share some of the same blues, keeping the space cohesive. Drapery. Design by Pappas Miron Design. Sheer living room curtains provide texture to a space without the visual weight of colors or patterns. If you only have windows on one side of your home, sheers also help maximize the natural light. In smaller spaces, like this Carnegie Hill home by Pappas Miron Design, allowing the curtains to blend in with the walls can help the space feel larger. Instead of emphasizing the far wall, sheer living room drapery adds a touch of softness to the windows without drawing too much attention to themselves. 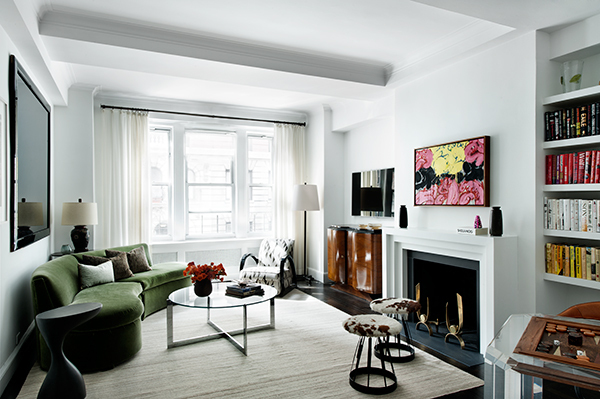 Instead, the eyes focus on the bright artwork above the fireplace and the emerald green couch. An open glass coffee table and open-bottom stools also add to the feeling of openness. Drapery. Design by Roop Rang Interiors. Photo by Gurusurya Photography. 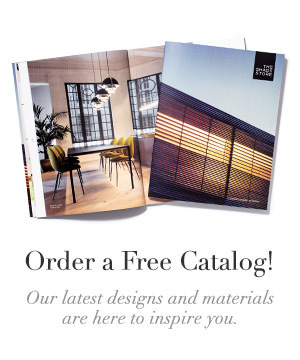 With more than 500 exclusive materials, The Shade Store can make almost any drapery vision come true. 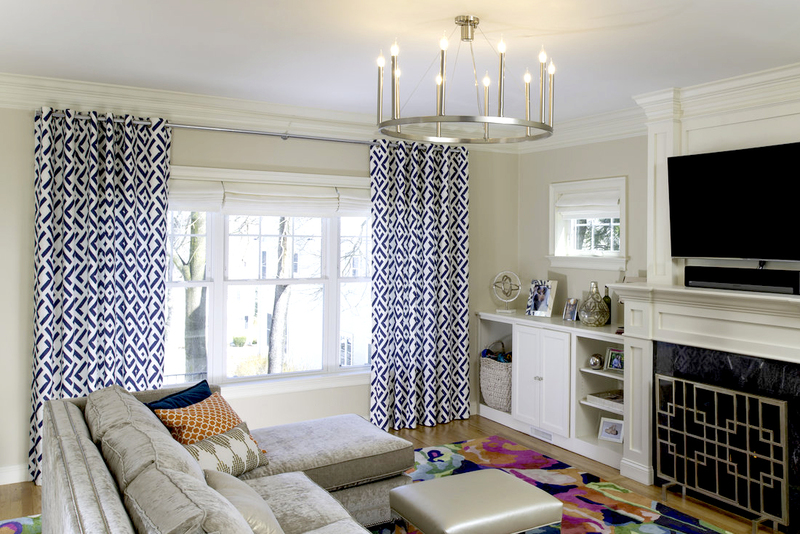 Another one of our favorite looks for living rooms is rich, lined curtains. Linings help drapery hang beautifully (and protect the material from sun damage), as well as add privacy and light blockage. 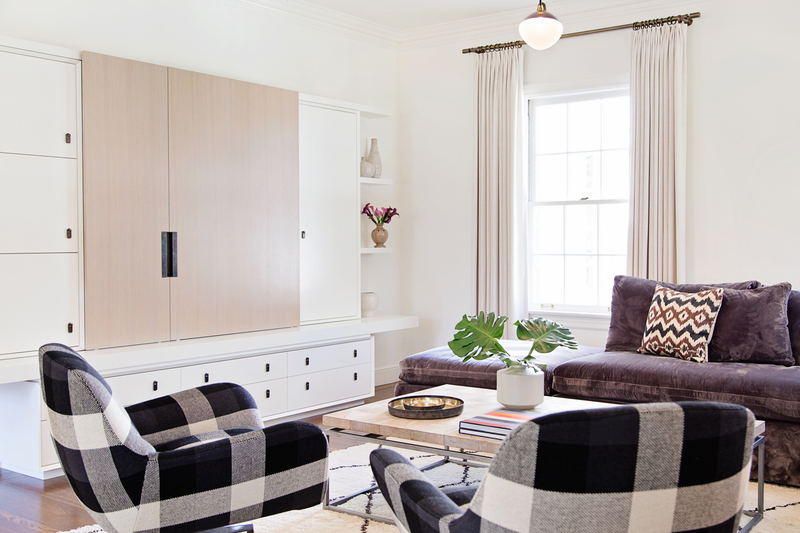 In this San Francisco home, Roop Rang Interiors opted for living room curtains that draw upon the color of the custom built TV cabinet. The lined material blocks light and glare when closed, so the whole family can enjoy watching TV from every angle during the day or night. Browse our living room window treatment Photo Gallery for more living room curtain ideas, or stop into a showroom and chat with a Design Consultant. 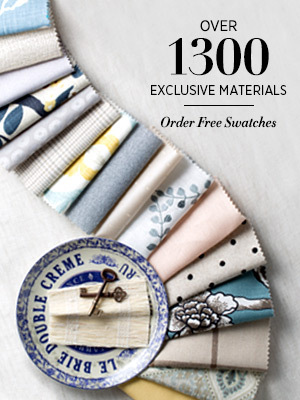 From material to lining to hardware, we will help create the ideal living room curtain designs for your home.